On The Bookshelf….. ………………………...So Many Books, So Little Time! 1 On The Bookshelf….. ………………………...So Many Books, So Little Time! 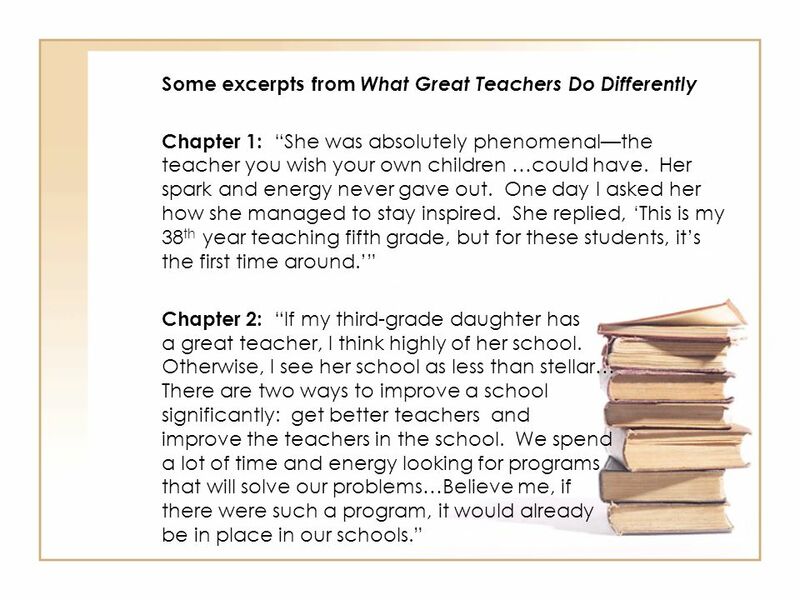 This short book is about “what great teachers do that sets them apart. 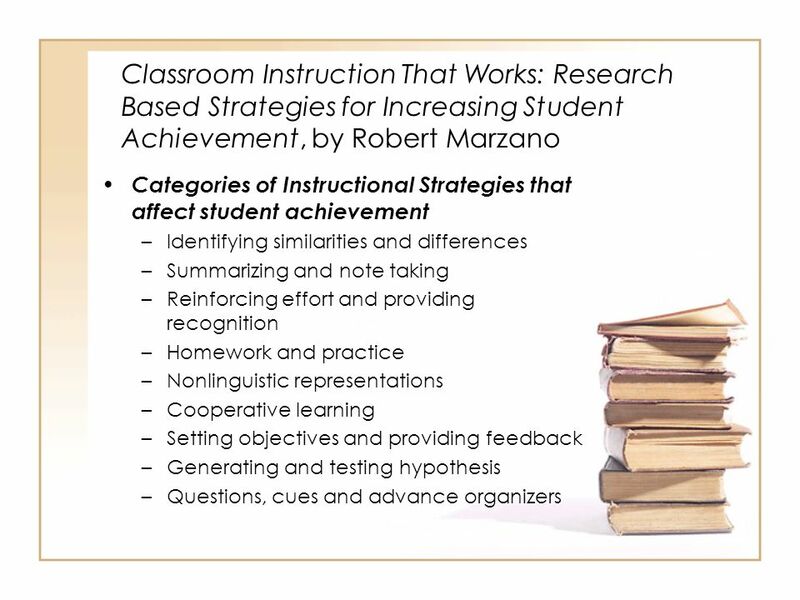 Clarifying what the best educators do, and then practicing it ourselves,” it purports, “can move us into their ranks.” It offers 14 chapters that examine different elements of effective teaching styles. Chapter titles include “It’s People, Not Programs”, “Prevention Versus Revenge”, “Who is the Variable?”, and “The Teacher is the Filter”. 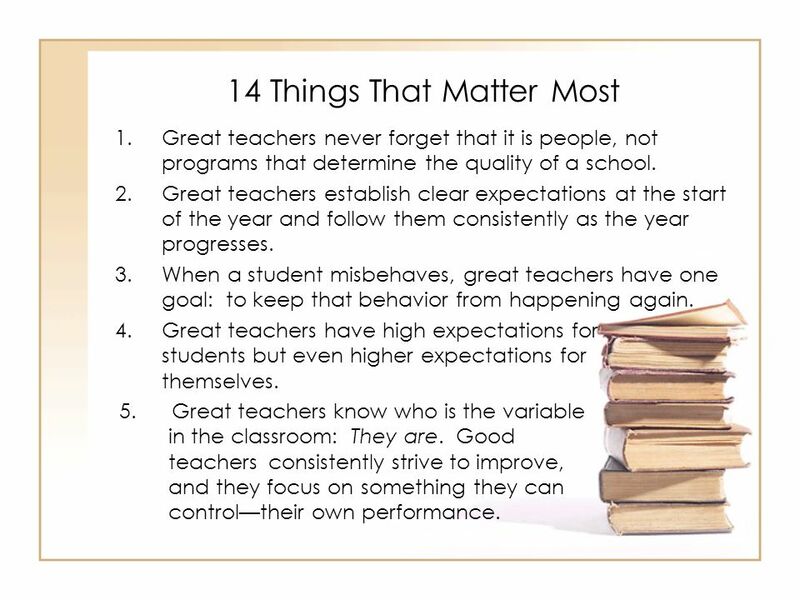 Great teachers never forget that it is people, not programs that determine the quality of a school. 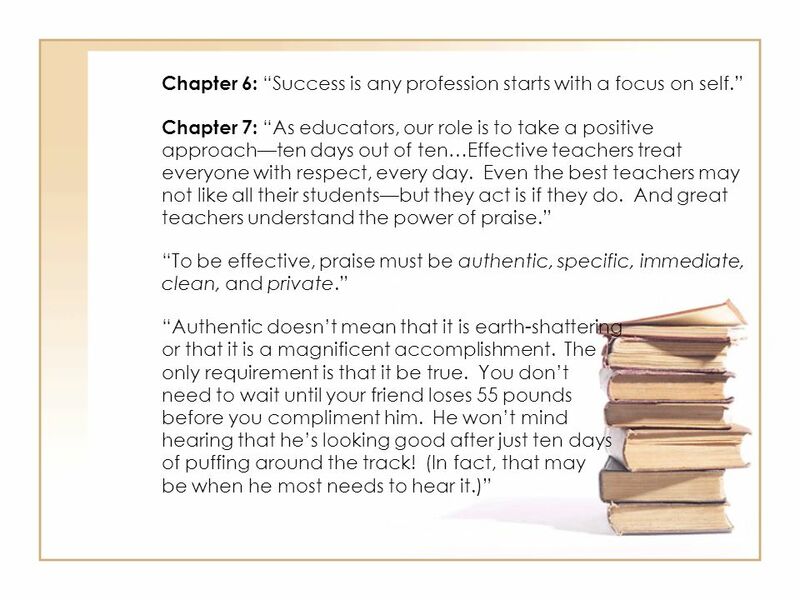 Great teachers establish clear expectations at the start of the year and follow them consistently as the year progresses. 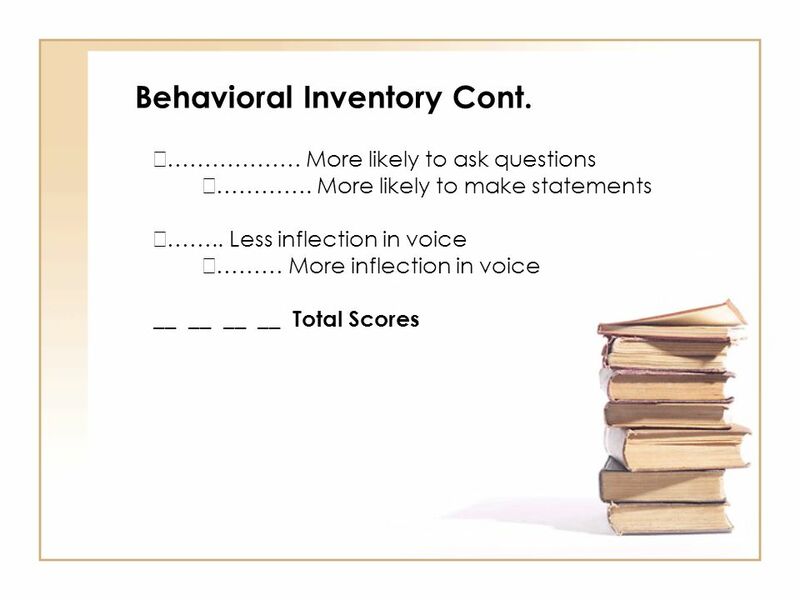 When a student misbehaves, great teachers have one goal: to keep that behavior from happening again. 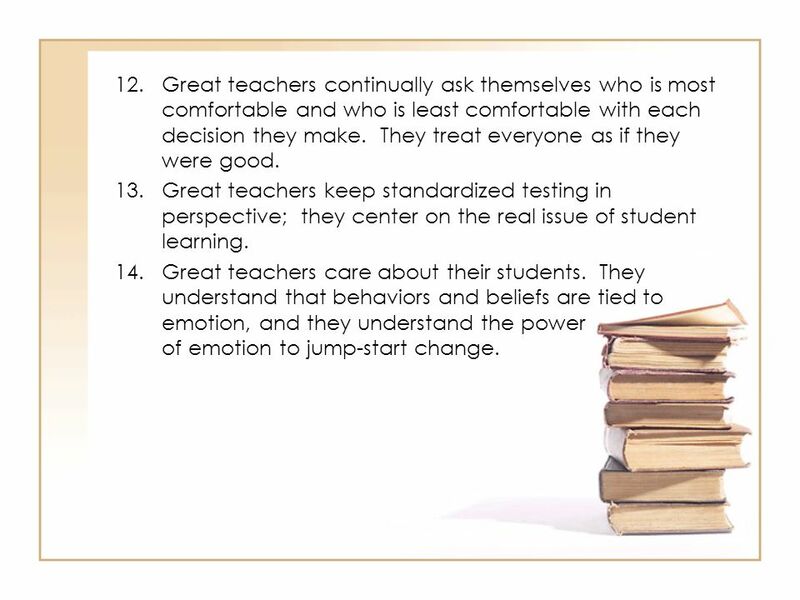 Great teachers have high expectations for students but even higher expectations for themselves. 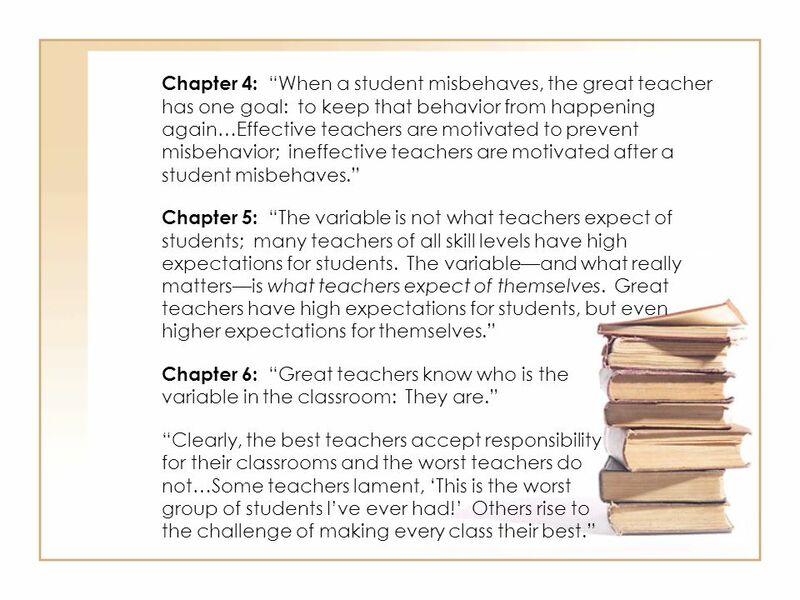 Great teachers know who is the variable in the classroom: They are. Good teachers consistently strive to improve, and they focus on something they can control—their own performance. 4 Great teachers consistently filter out the negatives that don’t matter and share a positive attitude. Great teachers work hard to keep their relationships in good repair—to avoid personal hurt and to repair any possible damage. 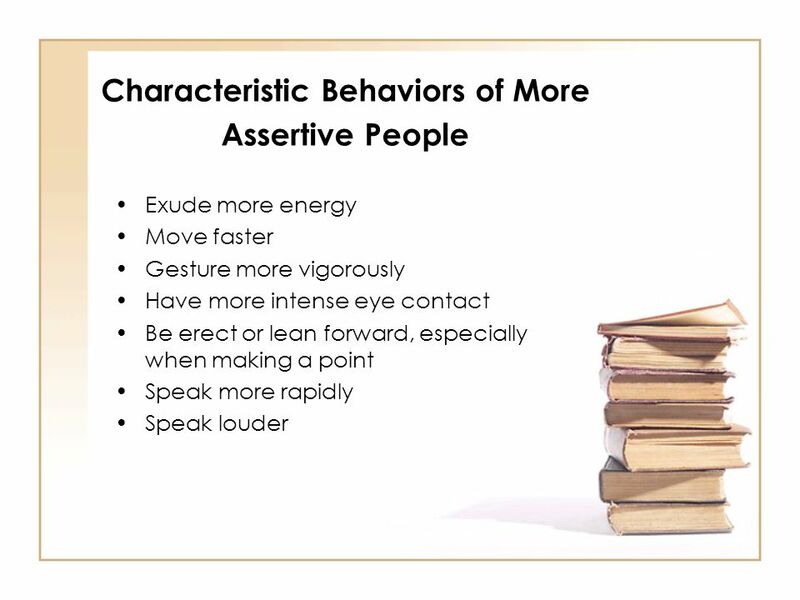 Great teachers have the ability to ignore trivial disturbances and the ability to respond to inappropriate behavior without escalating the situation. Great teachers have a plan and purpose for everything they do. If things don’t work out they way they had envisioned, they reflect on what they could have done differently and adjust their plans accordingly. Before making any decision or attempting to bring about any change, great teachers ask themselves one central question: What would the best people think? 5 Great teachers continually ask themselves who is most comfortable and who is least comfortable with each decision they make. They treat everyone as if they were good. Great teachers keep standardized testing in perspective; they center on the real issue of student learning. Great teachers care about their students. 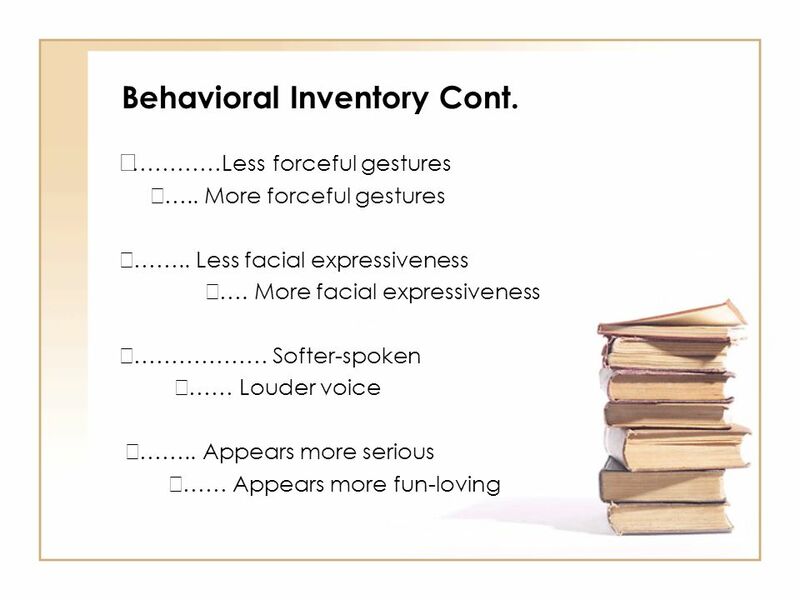 They understand that behaviors and beliefs are tied to emotion, and they understand the power of emotion to jump-start change. 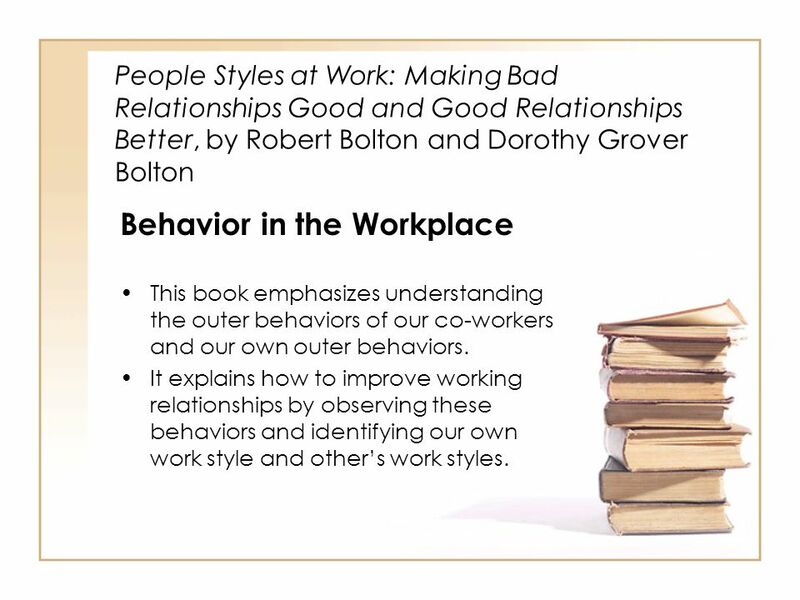 People Styles at Work: Making Bad Relationships Good and Good Relationships Better, by Robert Bolton and Dorothy Grover Bolton Behavior in the Workplace This book emphasizes understanding the outer behaviors of our co-workers and our own outer behaviors. 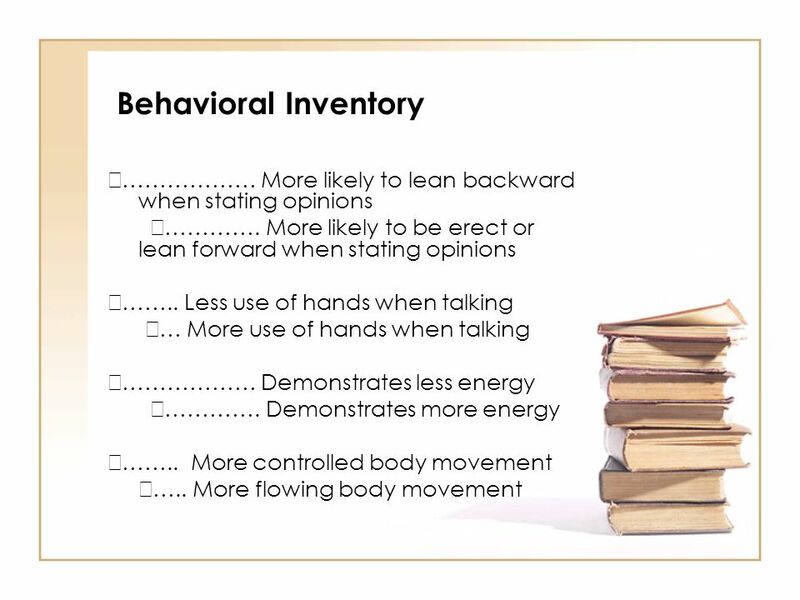 It explains how to improve working relationships by observing these behaviors and identifying our own work style and other’s work styles. 10 What’s Your Style? 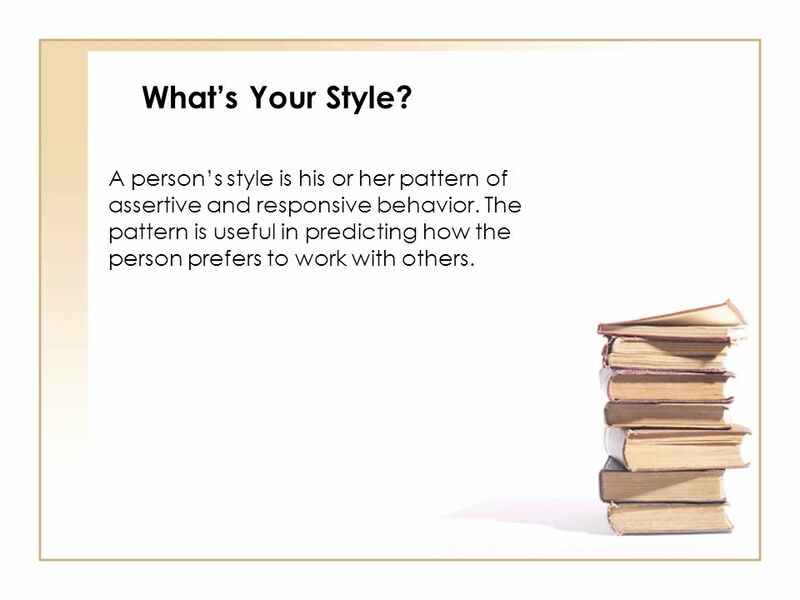 A person’s style is his or her pattern of assertive and responsive behavior. The pattern is useful in predicting how the person prefers to work with others. 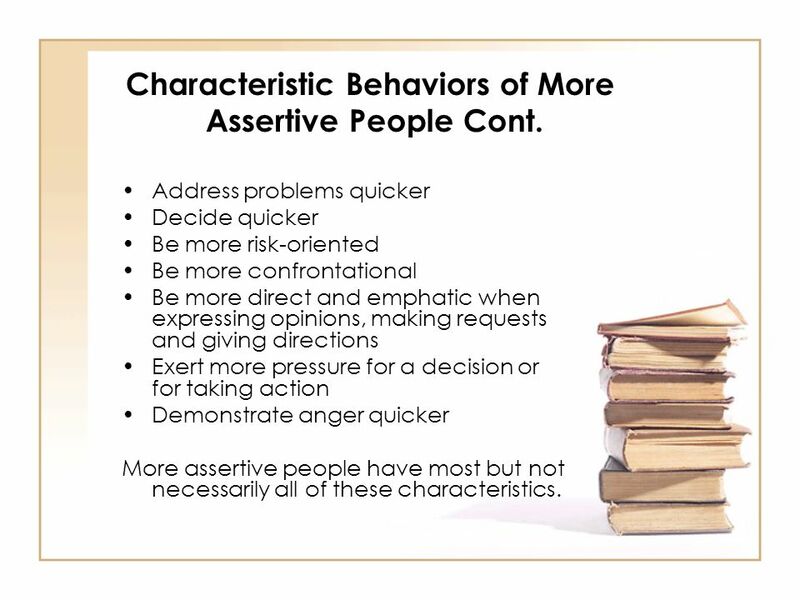 Assertive People Cont. Address problems quicker Decide quicker Be more risk-oriented Be more confrontational Be more direct and emphatic when expressing opinions, making requests and giving directions Exert more pressure for a decision or for taking action Demonstrate anger quicker More assertive people have most but not necessarily all of these characteristics. 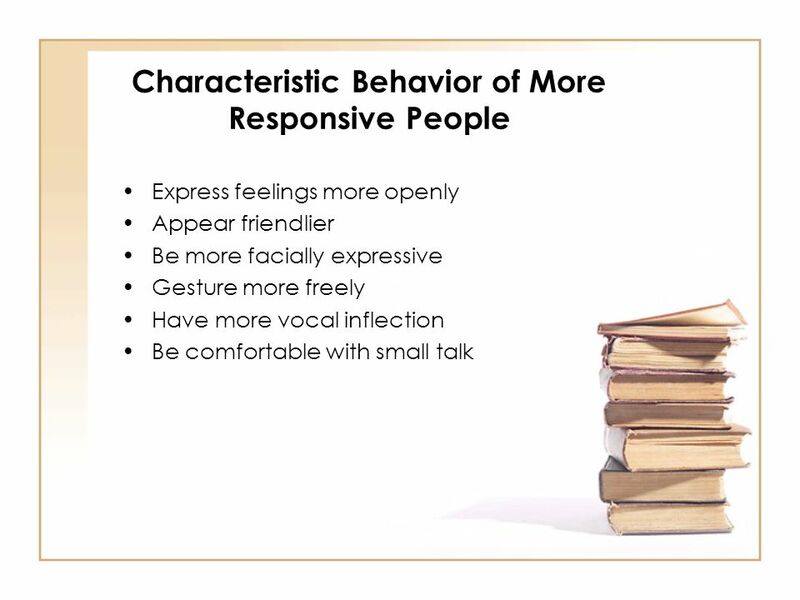 18 Characteristic Behavior of More Responsive People Cont. 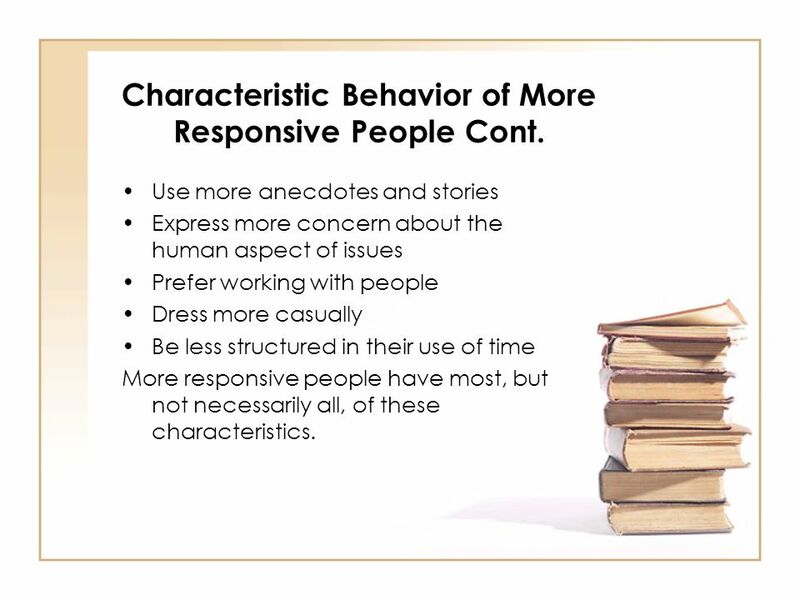 Use more anecdotes and stories Express more concern about the human aspect of issues Prefer working with people Dress more casually Be less structured in their use of time More responsive people have most, but not necessarily all, of these characteristics. 20 You Learn…. There are four styles of people – none of which is better or worse than the other styles. 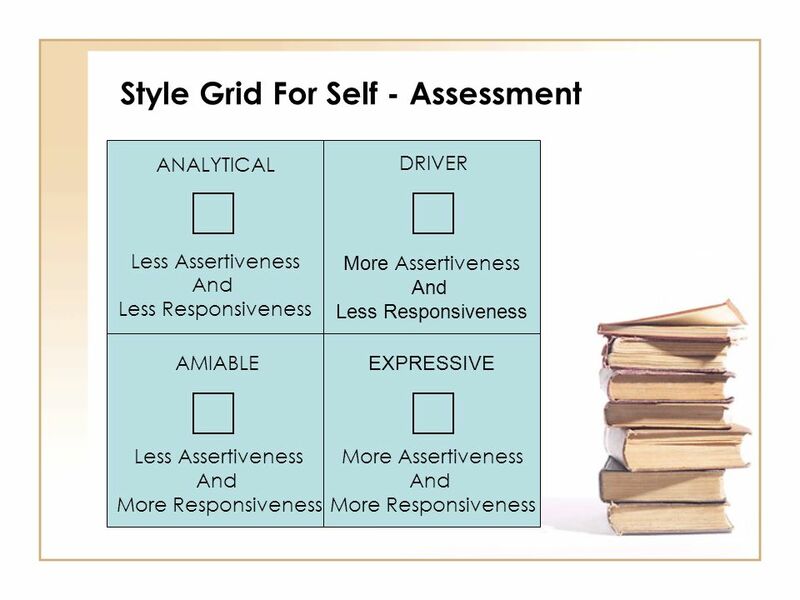 Each style has characteristic strengths and weaknesses not shared by the other styles. 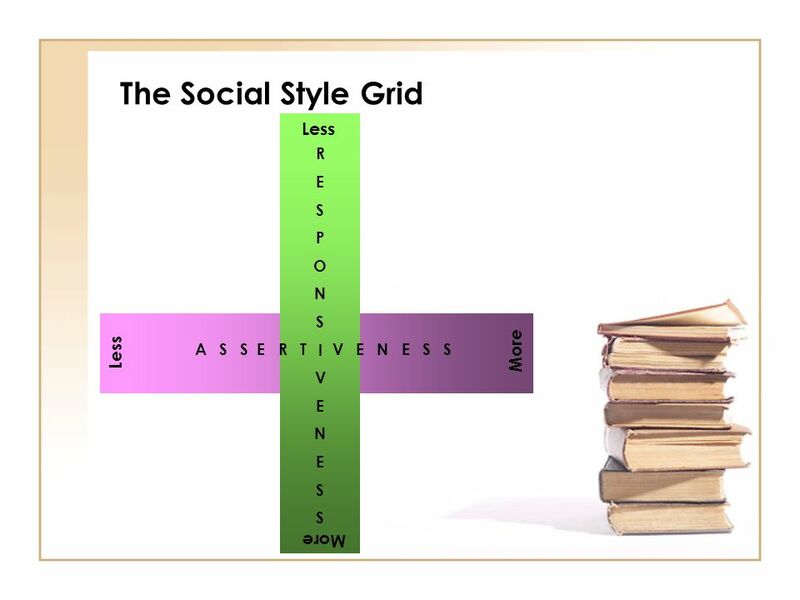 Each individual has a dominate style that influences the way that individual works. Our population is evenly divided between these four styles. People of each style can be successful. 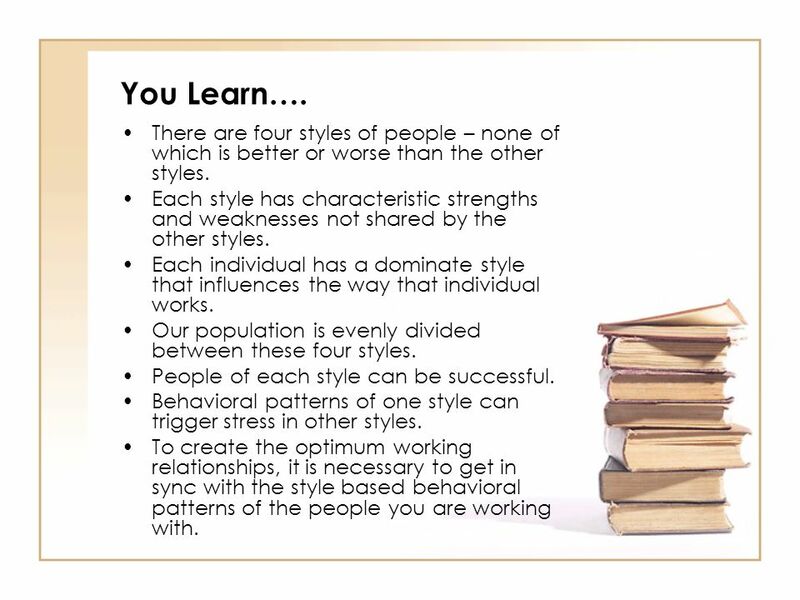 Behavioral patterns of one style can trigger stress in other styles. To create the optimum working relationships, it is necessary to get in sync with the style based behavioral patterns of the people you are working with. 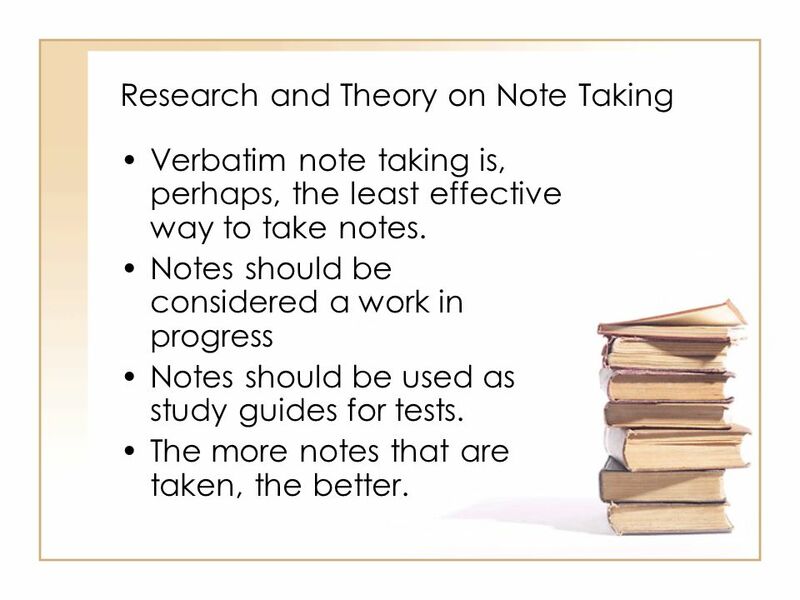 Verbatim note taking is, perhaps, the least effective way to take notes. 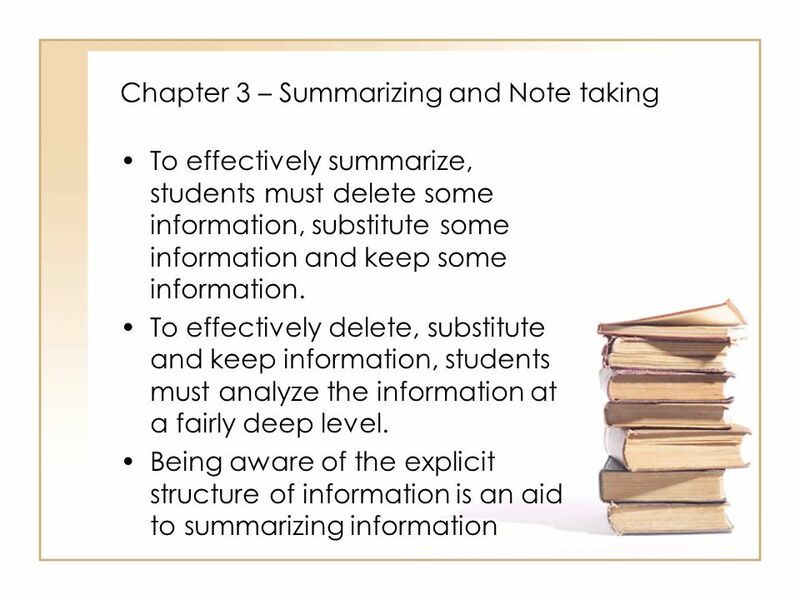 Notes should be considered a work in progress Notes should be used as study guides for tests. 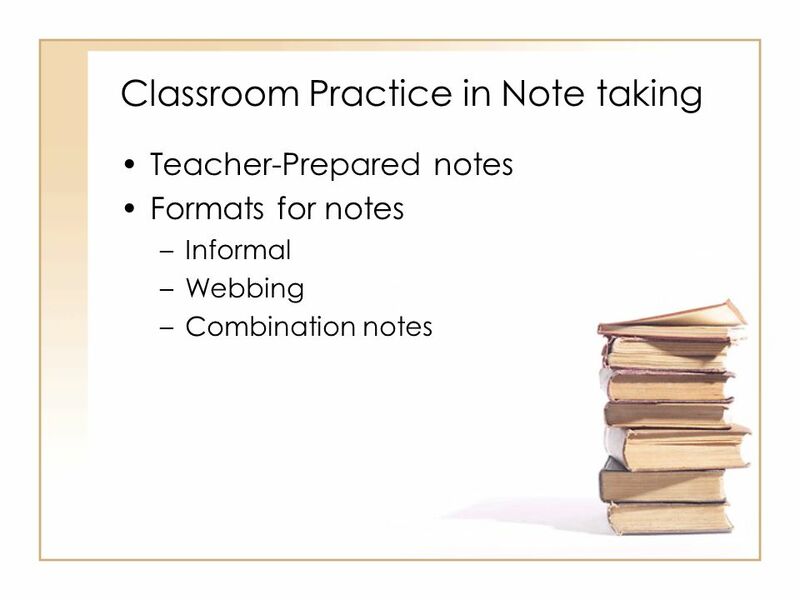 The more notes that are taken, the better. 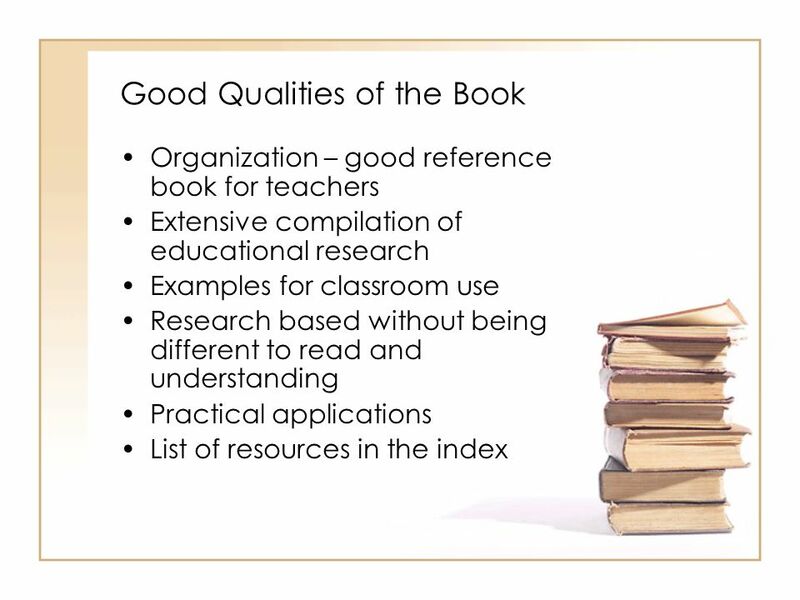 26 Why is this book important? Stressed the need for high quality staff development at a critical time when schooling and teaching is becoming more of a science than an art. For change to occur we all must provide and participate in: Provide time for adequate modeling and practice Provide Feedback Allow for differences in implementation of strategies Celebrate teachers as learners! 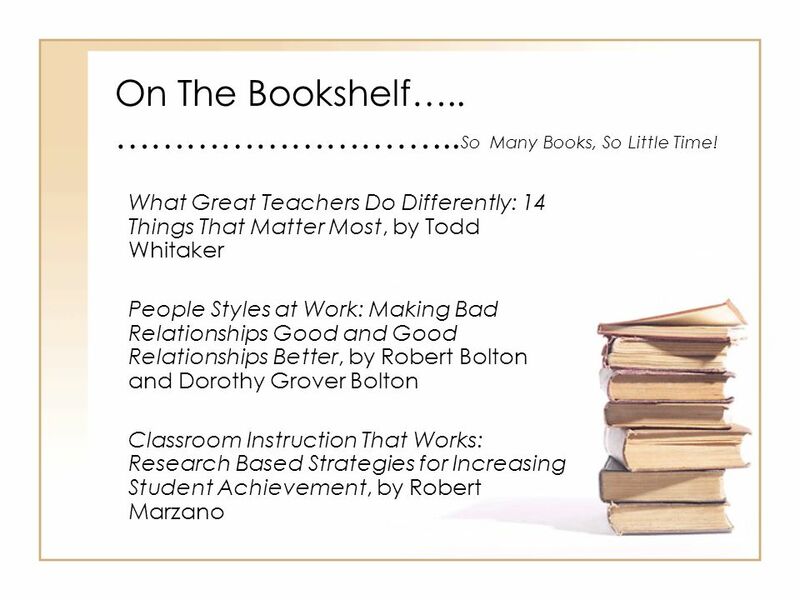 Download ppt "On The Bookshelf….. ………………………...So Many Books, So Little Time!" 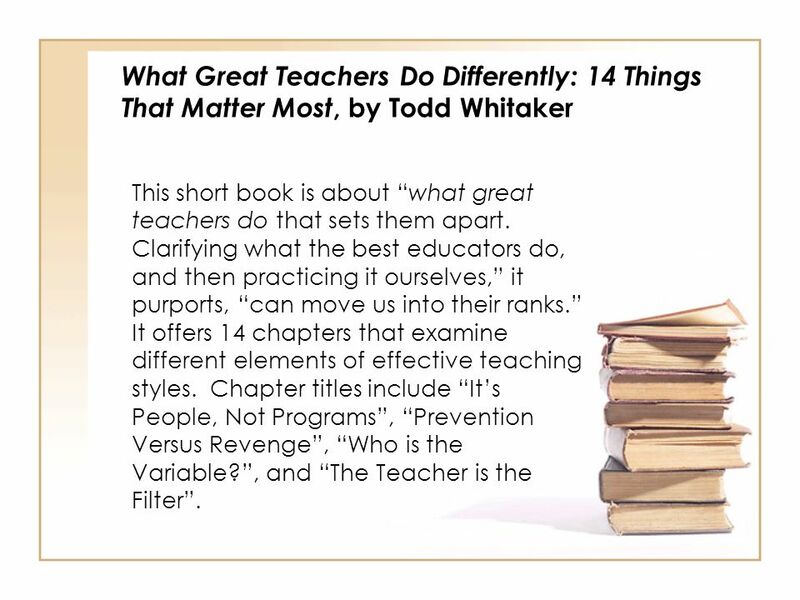 Effective Teachers “What Great Teachers Do Differently” Todd Whitaker. Suicide Awareness and Prevention in Health Education Brian Griffith Health Education Specialist Maryland State Department of Education. Lisa K. Marzoli, BS, MBA Wellness Coordinator, Anthem. Beginning with the End in Mind Overview of “Backwards Design” Jim Wright Kennesaw State University.  When you are ready › The more comfortable you feel, the more likely it is they will feel uncomfortable.  Do not hurry to interact with the teacher. Effective Adult Learning Presentation for the ERWC Task force Kathleen D. Rowlands.